Wong Sheung was born on May 10, 1924 in Canton, China and was one of seven children. He started learning Kung Fu from his father Master Wei Ching Wong at 8 years old. At 14 he moved to Hong Kong and at 15 years old he opened his own Kung Fu club and started teaching others. At 18 he joined the Chinese army and fought against the Japanese in Shanghai, Nanking. He returned to Hong Kong when he was 21 years old and at 23 he married Ann in his home village of Toi Shan. In 1947 he founded the Hung Lock Kung Fu club in Hong Kong. Sheung and his family emigrated to Canada in 1974 where he founded the Wong Sheung Kung Fu Club. Sigung Sheung founded the Wong’s Association of Victoria and was founder and president of the Freemasons Sports Club of Victoria. He served as the chief of the Freemasons for Canada as well as serving as the President and Chief of the Chinese Freemasons in Victoria. He acted as consultant to the Chinese Consolidated Benevolent Association and the Toi Shan Benevolent Association. 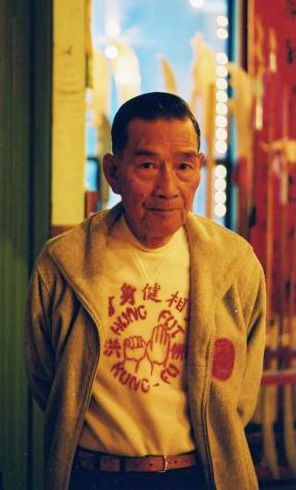 Master Wong also acted as honorary president for many Kung Fu clubs across Canada. In 1996 he became an honorary citizen of Victoria. Sheung Wong passed away December 5th, 2001. Everyone who knew him will miss his sense of humour, generosity, unique personality and strong spirit.